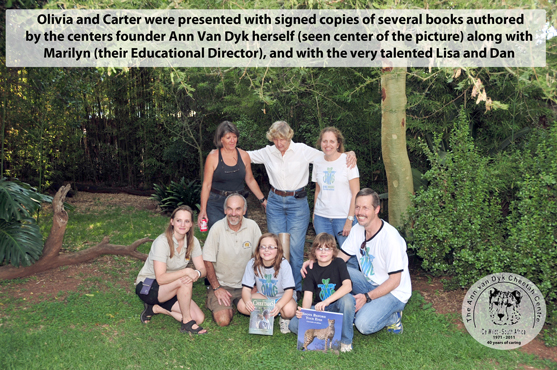 As you all know by now, One More Generation was started after our founders Olivia and Carter had been adopting Cheetah’s in South Africa for years. As they got older. 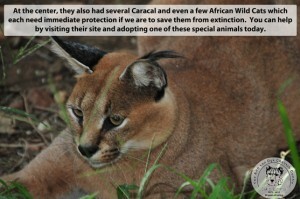 they realized that unless people got involved via animal adoptions and or donations to organizations who are working hard to save a species, there may not be any of these animals for the next generation. 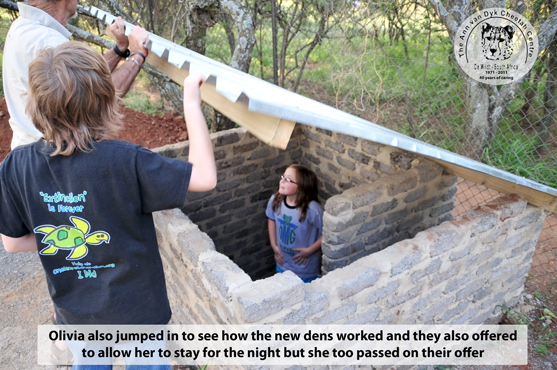 Since starting One More Generation, Olivia and Carter have been working hard to try and raise awareness to the plight of many species who desperately need help and to show everyone that “Anybody Can Make A Difference“. Adopting an animal is one of the easiest and most rewarding ways that even kids can get involved. Since starting OMG, Olivia and Carter have added a whale shark from our local aquarium (this adoption was a gift to the kids. We personally disagree with the practice of confining these majestic creatures), they added two beautiful fruit bats from the Lubee Bat Conservancy, and after their visit to the Jane Goodall’s Chimpanzee Eden in South Africa, they both agreed to add a couple of Chimpanzees to their list of adopted critters. 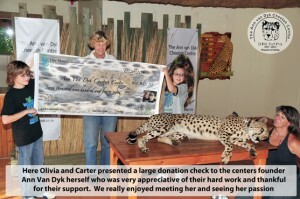 Carter and Olivia have been hosting various fundraising events over the past year in an effort to help raise funds to further support the work that the Cheetah Center does. After months of hard work, they had finally amassed $1,000.00 for the Ann Van Dyk Cheetah Center so this Dec, we traveled to South Africa to present the donation to the founder of the center and so that the kids could finally meet their cheetahs in person. We combined our trip with several visits to other organizations fighting hard to save species and we even added an humanitarian component to our trip which we will be posting later. We landed in South Africa on Dec 19th (after over 24-hours of traveling) and then headed out first thing on the morning of Dec 20th for our visit to the cheetah center. 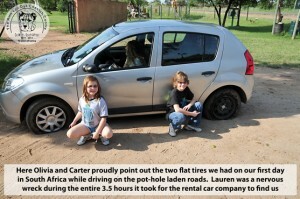 BTW, if you are ever traveling in South Africa, we would recommend getting the supplemental car insurance which covers tires and windshield since their roads are filled with pot-holes as can be seen in this photo. At the center, they have more than just cheetahs, they also have some of the most adorable African Painted Dogs you will ever meet. 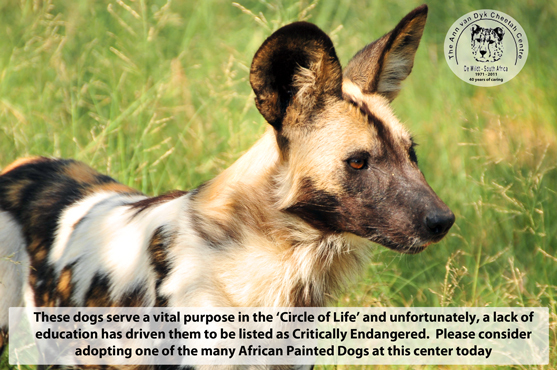 The African Wild Dog is a critically endangered species being driven to almost certain extinction by human overpopulation, habitat loss and predator control killing. It uses very large territories (and so can persist only in large wildlife protected areas), and it is strongly affected by competition with larger carnivores that rely on the same prey base, particularly the lion and the Spotted Hyena. Most of Africa’s national parks are too small for a pack of wild dogs, so the packs expand to the unprotected areas, which tend to be ranch or farm land. Ranchers and farmers protect their domestic animals by killing the wild dogs. 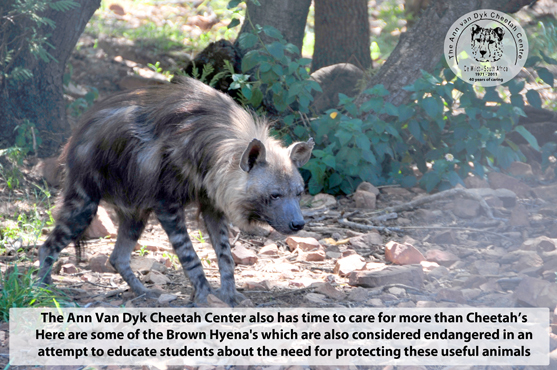 Like other carnivores, the African wild dog is sometimes affected by outbreaks of viral diseases such as rabies, distemper, and parvovirus. Although these diseases are not more pathogenic or virulent for wild dogs, the small size of most wild dog populations makes them vulnerable to local extinction due to diseases or other problems. 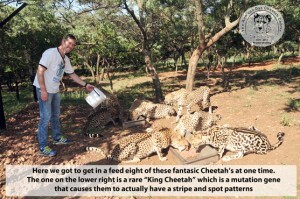 The folks at the Ann Van Dyk Cheetah Center work very hard to try and help save these precious animals. 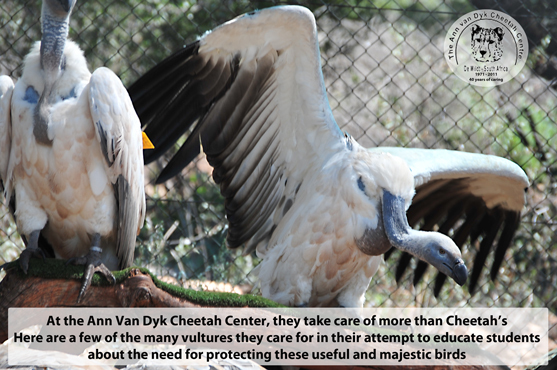 They have been successfully breeding these animals and trying to educate communities to the value they have on our ecosystem. 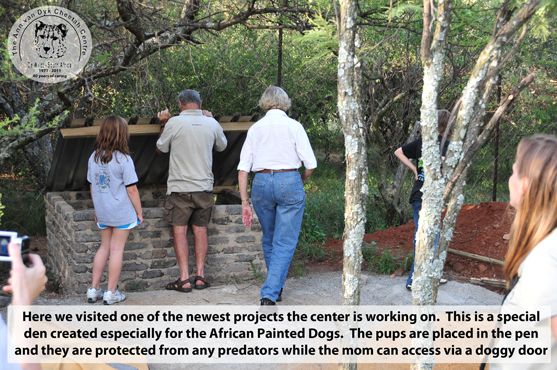 They have also been experimenting with building special dens for the dogs expecting pups. The dens line the outside of the sanctuary perimeter and have a special entrance (sort of like a doggy door controlled by staff members) which allows the mother access to her pups who are safe inside where they can not escape nor can predators enter to find them. We think that their new system will work and we look forward to hearing of their successes. 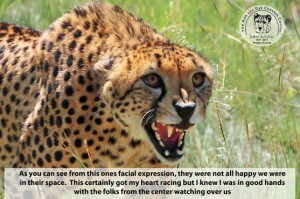 The main attraction to the center has to be their large assortment of healthy and lovable cheetahs. 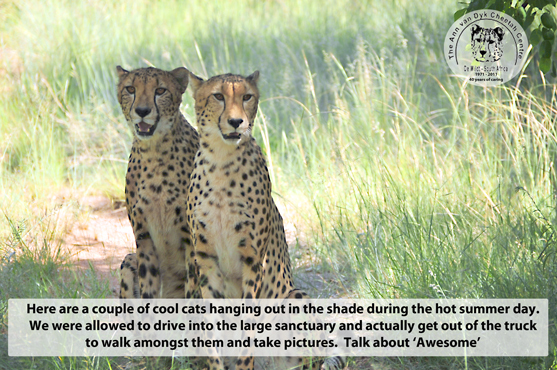 We were given a private tour of the facility and even allowed to venture in to the sanctuary among the living area of these fascinating animals. While driving to the cheetah section of the center, we passed by some of the various species that they care for as well including the Caracal, African Wild Cats, Brown Hyena and various types of Vultures including the Egyptian Vulture and the Lappet-faced Vulture, all of which are considered endangered and unless protected, are sure to become extinct in our lifetime. We were amazed to learn about how little is known by the average person about these and many other animals who desperately need help. At the center, they offer Adoptions for any budget and each species is reliant on your help if they are to survive for “One More Generation”… and beyond. 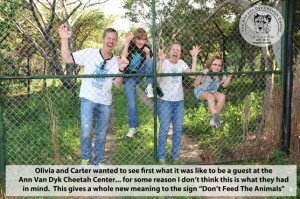 As we entered the cheetah section, we saw nothing but trees and brush. There was a still quiet in the air. We drove for several minutes continuing to call out to the animals as they do daily during feedings. Suddenly we saw our first cheetah, better said our first two cheetahs. As we turned the corner we saw these two amazing specimens sitting side by side watching our every move. 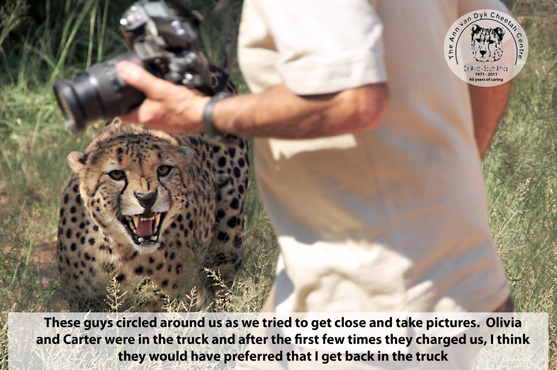 Next, I was allowed to exit the truck for a once in a lifetime opportunity to walk among these amazing animals. While Carter was not that pleased that I exited the vehicle, he did love the great pictures we were able to get. As I walked around, I was overwhelmed with emotions, especially when the first cheetah approached to make sure I knew whose territory this is. Our guide Dave also had a blast walking around the grounds but even he was not immune to their occasional show of dominance. It was very impressive to see how these cats get their message across. 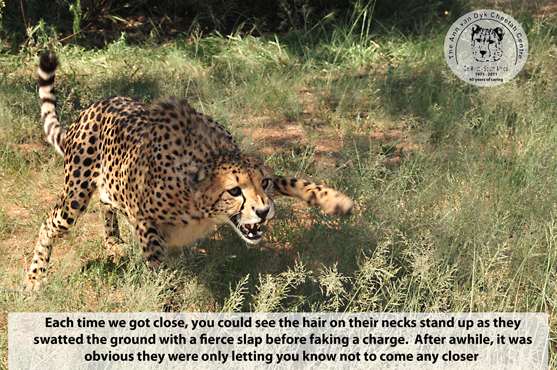 They would circle around us and then the one closest to us would tuck its tail, raise the hair on their necks and swat the ground with a fierce slap just before lunging one or two steps closer. As long as you stood your ground they basically back down (I’m sure that’s not the case in the wild) but it was very intense and impressive at the same time. 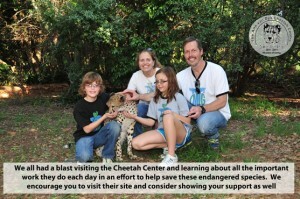 We continued our tour to see even more cheetahs and other animals cared for by the great team at the center. One of the many species we saw were Impalla, and lots of them. 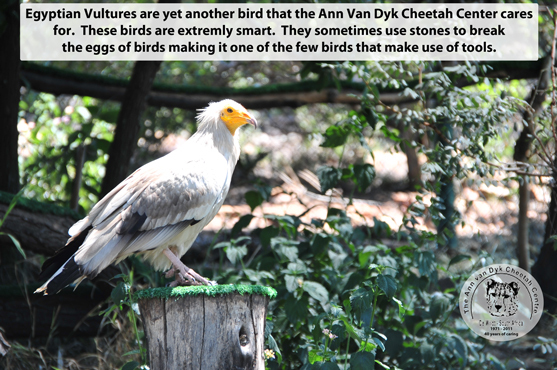 We also learned an interesting fact about how these animals are regarded by their many predators. If you look close at the picture, you will see what we mean. 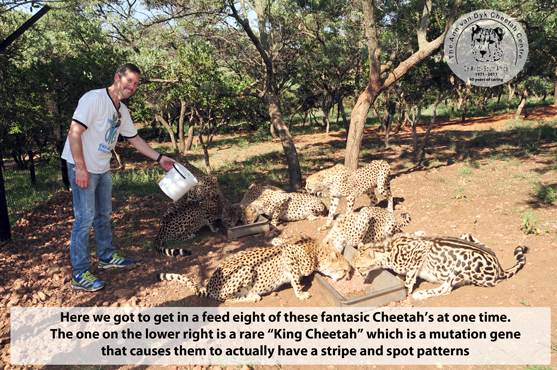 Next we got to go to the pens where they keep some of the cheetahs to help feed them. Olivia and Carter got to actually help fix their meals and mix their vitamins and medicines in with their raw meat. Olivia was quicker to reach in to the food dishes than Carter but they both eventually did it, and then we went out to feed these hungry animals. Check out the King Cheetah we also saw. 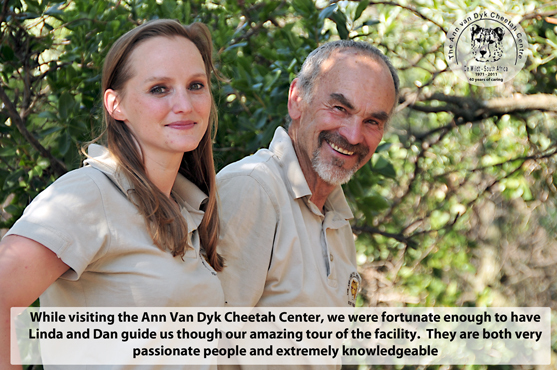 Linda and Dave were the best tour guides we could have hoped for and they truly care about every single animal in the sanctuary. We wish to thank them and the entire staff at the center for all they do to help raise awareness about the plight of endangered species. Carter and Olivia had a blast visiting the center but their best part was actually getting into the pens with the cheetahs they have been adopting for years. You can see the smiles on their faces as they posed for these pictures. 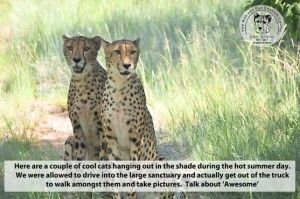 As we were leaving the cheetah center to go and visit with the sanctuary’s founder, we were given the opportunity to see first hand how these animals live everyday. I am not sure this is what the kids had in mind. 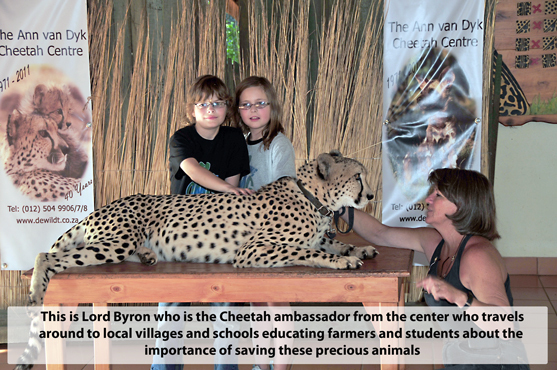 Next we headed over to the education section where we met the center’s Director of Education, Marilyn, along with the center’s ambassador Lord Byron who travels the country educating students and farmers about the need to preserve the species and how we can all learn to live together with each other. The center is working on helping to provide farmers with special dogs which are trained to scare off cheetahs so that the farmers don’t lose their valuable livestock to hungry cheetahs. 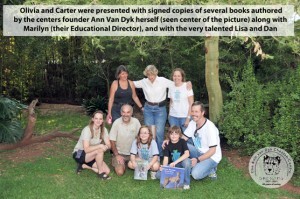 Then we got to meet with Ann Van Dyk herself and she actually spent over an hour with us fielding questions from Olivia and Carter about all her hard work and what it takes to run such a large and successful sanctuary for forty years. Next, we got to present Ann with a large check which Carter and Olivia had personally collected via numerous fundraising events in an effort to help the center continue their work. Before leaving, they allowed us to visit with one more of their special cheetahs named Scarlett. This was probably the highlight of Olivia and Carter’s because this cheetah was the most laid-back animal you could have ever imagined. Finally, we had another opportunity to meet with Ann and her key staff members for a final farewell. The folks involved with Ann and her dream are all amazing people and we are so fortunate to have had the opportunity to be part of their day. If you have never considered Adopting an animal, we encourage you to start now. 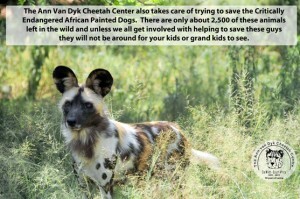 Even a few dollars can make a big difference and it may well be just what helps save these amazing animals for the next generation. Thank you for caring and we hope you too are inspired to want to get involved with making a difference.